• The inside story on the rescue of the William Pierce Memorial Library — which includes not only Dr. Pierce’s research library, and truly impressive libraries donated by National Alliance members, but also Dr. Pierce’s own extensive notes on some of the books therein. These invaluable volumes were saved from the auctioneer’s block only by the timely intervention of Will Williams. • The latest updates on the ongoing construction of the new National Alliance complex in the Allegheny Mountains of Tennessee. • Chairman Williams’ evaluation of where the Gliebe/Walker years have left the Alliance — and where we need to go from here. 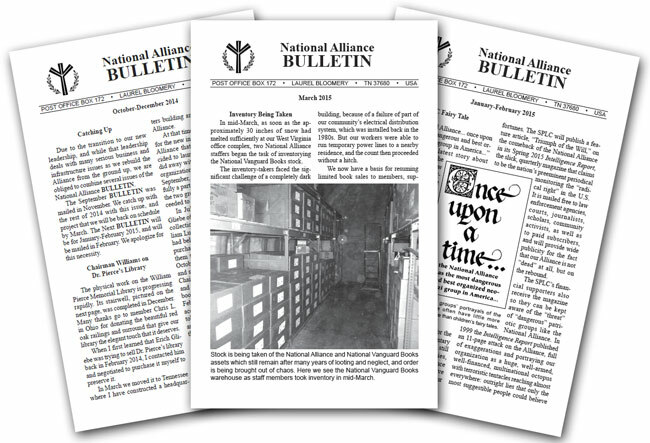 • The restoration of the National Alliance BULLETIN to Dr. Pierce’s original format. • Detailed information on the McCorkill bequest case, and the fate of the over $250,000 that Dr. McCorkill left the Alliance in his will. • The reasons for the restoration of the National Alliance as a membership organization — and the options you have to be either a supporter or a member. • The initiation of a professional online payment system for the Alliance, and your ability to donate or regularly support us either through traditional postal mail or online — and our avoidance of Paypal, who are currently being pressured to cancel the accounts of racially conscious Whites. • Exclusive pieces on the history of the National Alliance, and Dr. Pierce’s own evaluation of Will Williams — who was appointed as both the National Alliance’s first membership coordinator and regional leader — and myself, who was given full rights and responsibility for National Vanguard magazine, the nationalvanguard.org Web site, the National Alliance BULLETIN, and all other Alliance media by Dr. Pierce. • The real story behind the $2 million dollar lawsuit against Erich Gliebe. • Regular updates on the status of National Vanguard Books. • A full explanation of the SPLC’s obsessive focus on the National Alliance; their purpose, their prejudices, their lack of standards and integrity; and how the perceptive can see through their propaganda in a way that benefits us. • Regular updates on the renovation of the long-neglected National Alliance facilities in West Virginia, and information about what our needs are to restore our community’s buildings and infrastructure there. • Special book offers for National Alliance members only. • An in-depth dialogue with Fred Streed — one of Dr. Pierce’s closest long-term associates — on the subject of Cosmotheism, the philosophical and spiritual basis of the new White world we want to build. • Why a certain book issued by the Gliebe/Walker Alliance has been withdrawn and repudiated — and all remaining copies consigned to the flames. • A lively column of letters to Chairman Williams on many matters of concern to National Alliance members — and the Chairman’s responses. All this — and much more — will come to your mailbox with every issue of the National Alliance BULLETIN. The BULLETIN is available only to National Alliance supporters and members , and it is available only as a printed publication — nowhere is it downloadable as a PDF or any other digital format. Only a radical reordering of our values can save our race and nation in these dangerous times. The National Alliance is the means by which a community embodying those values is being built. It is also the means by which those values will be propagated to all those members of our race who are capable of understanding them. By joining the National Alliance, you will not only gain in understanding — you will be taking part in the great task we have set for ourselves. By joining the National Alliance you will be giving your life meaning and focus. By joining the National Alliance you will no longer be a spectator: You will be a participant in the struggle for our race’s life and progress. You will make a difference. By the things you do today to help us, you will have an effect on the fate of not only the next generation — but on those who live a thousand generations hence. Join the National Alliance at natall.com today — or write to National Alliance, Box 172, Laurel Bloomery TN 37680 USA. I’ll repeat that address at the end of this program. Coming up — my somewhat humorous look at what I call “the elephant in the room,” next on American Dissident Voices. Now I don’t hate elephants at all. But I don’t want to live with them in my home or workplace. It wouldn’t work. We’re not meant to live together. If we tried, it would be a disaster on all sides. It could even lead to disease and death if we insisted on carrying such nonsense to its ultimate conclusion. Likewise, I and millions of other White people don’t want to live with other human races in our White society. It’s proving to be a disaster all around. Eventually, it will kill us if we persist in such folly. That doesn’t mean I hate other races just because they exist. That’s crazy. It does means that we should live in our own separate, independent societies. Nature, as Jefferson said, has drawn indelible lines of distinction between the various human races that can never be erased — and, as Jefferson also said, the differing races should not live under the same government. But, like them as you may, it is the height of foolishness to invite elephants into your home on terms of equality. I’m not referring to some billionaire who has exotic animals behind walls or behind glass on his estate. That’s really no different than a zoo. That’s not what I’m talking about. When I talk about having elephants in your home on terms of equality, I mean having them right in the same rooms you and your family use. If your “love” for elephants was so overwhelming that it led you to adopt such a plan, what would happen? First of all, it wouldn’t be any good for the elephants. They’d hate it. The ceilings would be too low. The space would be too restricted. The rules of your home and of your town or city would be too restricted, too. They’d constantly be breaking the rules, trying to act as Nature has programmed them to act — to act in the only way they can to be natural and happy. They’d destroy your floor joists and ceilings, to say nothing of your carpets. The walls of your home would be caved in, and there’d soon be an elephant-sized hole where your door used to be. They’d find a source of water and spray everywhere, completing the destruction. Every appliance, every piece of furniture, every work of art or sentimental object or picture would be totally ruined. Eventually, even simple sanitation would become impossible and serious disease and other health problems would ensue. Just because you “loved elephants” and tried to live together with them. This is a crazy kind of “love” — that wrecks the lives of all parties involved in it. Obviously, I am making an analogy to the multiracialist program to open America’s borders to the Third World, which is causing a huge Mexican Problem all across this land in addition to all the other problems we already had with a growing non-White presence. As I said several years ago in my story “The Piranhas, the Birds, and the ‘Liberal’,” the authors of such programs to open our borders and mix the races are not motivated by love at all. They have been motivated by hate all along. They want to destroy us, and the importation of other races is one way they are trying to do that. As we Whites organize and begin to form a viable racial community, we’ve got to keep our thinking straight on this issue, or we’ll be victims again and again until we’re wiped out. The responsibility for the Third World immigrant problem in general and the Mexican Problem in particular does not fall primarily on the Mexicans and other Third Worlders. It falls on the planners who seek our doom. And it falls on those of us who accepted their lies. And it falls on those of us who know well what is happening and what is going to happen, but do nothing about it. Who is to blame for the elephants’ destruction of your home? The elephants? Not really. They were quite harmless to you and yours when they were roaming the plains of Africa. Those who came up with the crazy plan to bring them to your home are to blame — as are you for actively or passively going along with it. And so, to a very great extent, you are to blame, White man, White woman, for the Mexican invaders marching in the streets and demanding our wealth and our land. You are to blame for the non-White crime wave that is engulfing our cities. Yes, the Jewish supremacists had a hand in all this, to be sure, and they very much need to be dealt with. But so did White people, who sold out or wimped out and did nothing to stop the invasion, did nothing to stop the rapes and the killing, did nothing to stop the sexual slavery of White girls and women, did nothing to stop the Mexican invasion or the Muslim incursion, did nothing to stop the establishment of the false “moral” values — that White independence is bad and multiracialism is good — that grip our people. That’s reality. So as the Mestizos march by the thousands on our streets, and pressure the politicians to do their bidding and rip all the “White man’s laws” to shreds for their convenience, remember that they’re just doing what comes naturally. Ultimately, they’re building their own state, their own society. And so are the Muslims, as they build their mosques and institute their own laws, as they create their own state-within-a-state within our borders. As with the elephants, I don’t want to live in the same house or the same society with these non-Whites, but — also like the elephants — one must admit that they are now superior to us in some ways. They have an admirable degree of identity, racial-cultural unity, and many of them have a burning desire for independence and self-government. We would do well to emulate them in these regards. We need to be building a state-within-a-state ourselves. With a reborn racial consciousness, plus our undoubted intelligence and creativity, we would be unstoppable. White people need to take responsibility for the racial mess our nations are in; not so much in the sense of remorse over the mistakes of the past — that can’t change anything — but in the sense of doing whatever it takes to set things right. Join us in that great task today.